/home/sewunet/miniconda3/envs/qiime2-2019.1/lib/python3.6/site-packages/q2_types/per_sample_sequences/_transformer.py:344: UserWarning: Importing of PHRED 64 data is slow as it is converted internally to PHRED 33. Working with the imported data will not be slower than working with PHRED 33 data. Thanks a lot. 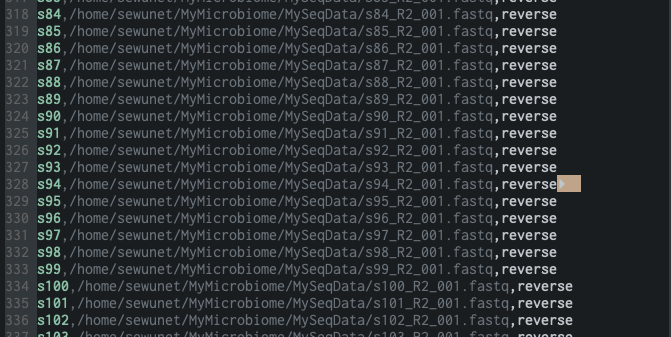 I have paired-end data, 233 forward and 233 reverse sequences for each sample. I don’t see anything wrong with this manifest - can you try again? Update the command and give it a shot! I did update the command but now I’m getting the earlier error. I know I’m bothering you with all the nonsense but hope you won’t give up on me. I spent months working on the tutorials but now I got my own data and couldn’t even import it. You have a tab after the word “reverse” on line 328 (reverse read for sample s94). Delete that and re-run and you should hopefully be good to go! Yes Yes Mattew, it worked. It finally worked. I already imported and checked the quality score. It is perfect and no words to thank you! !